The franchise's inception dates back to 1898, when a neighborhood group gathered to play in the Chicago South Side, calling themselves Morgan Athletic Club. Chicago painting and building contractor Chris O'Brien acquired the team, which he relocated to Normal Field on Racine Avenue. The team was known as Racine Normals until 1901, when O'Brien bought used jerseys from the University of Chicago. He described the faded maroon clothing as "Cardinal red" and the team became the Racine Street Cardinals. The team eventually became in 1920 a charter member of the American Professional Football Association (APFA), which two years later was rechristened to National Football League (NFL). The team entered the league as the Racine Cardinals, however the name was changed in 1922 to Chicago Cardinals to avoid confusion with the Horlick-Racine Legion, who entered the league the same year. Except for 1925, when they were awarded the championship after the Pottsville Maroons were suspended, the Cardinals experienced only minimal success on the playing field during their first 26 seasons in the league. During the post-World War II years, the team reached two straight NFL finals against the Philadelphia Eagles, winning in 1947 – eight months after Charles Bidwill's death – and losing the following year. After years of bad seasons and losing fans to the cross-town rivals Chicago Bears, by the late 1950s the Cardinals were almost bankrupt, and owner Violet Bidwill Wolfner became interested in a relocation. Not long after the 1987 NFL season, Bidwill agreed to move to Arizona on a handshake deal with state and local officials, and the team became the Phoenix Cardinals. 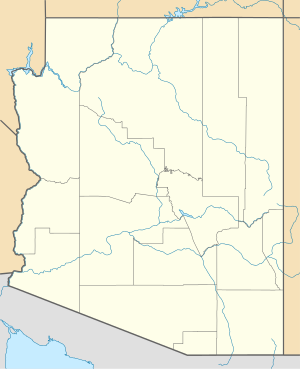 The franchise changed its geographic name from Phoenix to Arizona on March 17, 1994. (The franchise has never played in the city of Phoenix proper.) The 1998 NFL season saw the Cardinals break two long droughts, qualifying for the playoffs for the first time in 16 years. The team got their first postseason win since 1947 by winning the Wild Card Playoffs. In 2008, the Cardinals won the NFC Championship Game to advance to the Super Bowl for the first time in franchise history. They lost Super Bowl XLIII 27–23 to the Pittsburgh Steelers in the final seconds. After their historic 2008 season, the Cardinals posted a 10–6 record in 2009, their first season with 10 wins in Arizona. The Cardinals clinched their second consecutive NFC West title, and were defeated by eventual Super Bowl champion New Orleans Saints 45–14 in the divisional playoffs. The next time they would make the playoffs would be in 2014, when they ended up as a wild card. They set the best regular-season record in the team's history in Arizona at 11–5, but were defeated by the 7–8–1 NFC South champions Carolina Panthers. The next year, the Cardinals set a franchise-best 13–3 record, and clinched their first-ever first-round playoff bye as the NFC's second seed. They defeated the Green Bay Packers 26–20 in overtime, giving quarterback Carson Palmer his first playoff victory. The Cardinals then advanced to their second NFC Championship Game in their history, but were blown out by the top-seeded 15–1 Panthers 49–15, committing seven turnovers. In 1994, the Cardinals participated in the NFL's 75th anniversary throwback uniform program. The jerseys were similar to those of the 1920s Chicago Cardinals, with an interlocking "CC" logo and three stripes on each sleeve. The uniform numbers were relocated to the right chest. The pants were khaki to simulate the color and material used in that era. The Cardinals also stripped the logos from their helmets for two games: at Cleveland and home vs. Pittsburgh. The Cardinals' first home game in Arizona, in 1988, saw them play in red jerseys. Thereafter, for the next 18 years in Arizona, the Cardinals, like a few other NFL teams in warm climates, wore their white jerseys at home during the first half of the season—forcing opponents to suffer in their darker jerseys during Arizona autumns that frequently see temperatures over 100 °F (38 °C). However, this tradition did not continue when the Cardinals moved from Sun Devil Stadium to State Farm Stadium in 2006, as early-season games (and some home games late in the season) were played with the roof closed. With the temperature inside at a comfortable 70 °F (21 °C), the team opted to wear red jerseys at home full-time. 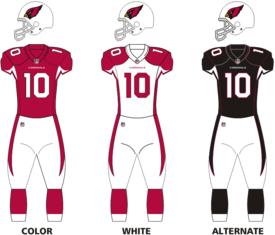 The Cardinals wore white jerseys at home for the first time at State Farm Stadium on August 29, 2008, in a preseason game against the Denver Broncos. The Cardinals wore white at home for the first time in a regular season game at State Farm Stadium against the Houston Texans on October 11, 2009. In October 2009, the NFL recognized Breast Cancer Awareness Month, and players wore pink-accented items, including gloves, wristbands, and shoes. The team thought the pink accents looked better with white uniforms than with red. From 1970 through 1983, and again in many seasons between 1989 and 2002, the Cardinals would wear white when hosting the Dallas Cowboys in order to force the Cowboys to don their "jinxed"[clarification needed] blue jerseys. They have not done this since moving into State Farm Stadium, however. The Cardinals' Ring of Honor was started in 2006 to mark the opening of State Farm Stadium. It honors former Cardinal greats from all eras of the franchise's history. Following is a list of inductees and the dates that they were inducted. The Cardinals' flagship radio station is KMVP-FM; Dave Pasch, Ron Wolfley, and Paul Calvisi handle the radio broadcast. Spanish-language radio broadcasts are heard on the combo of KQMR/KHOV-FM "Latino Mix" under a contract with Univisión, signed in 2015. Prior to 2015, they were heard on KDVA/KVVA-FM "José FM", as well as co-owned KBMB AM 710. The Cardinals were the first NFL team to offer all 20 preseason and regular season games on Spanish-language radio, doing so in 2000. Gabriel Trujillo and Rolando Cantú are the Spanish broadcast team. The Cardinals have the most extensive Mexican affiliate network in the NFL, with contracts with Grupo Larsa (in the state of Sonora) and Grupo Radiorama (outside Sonora) and stations in 20 cities, including Hermosillo, Guadalajara and Mexico City. As of the 2017 season, NBC affiliate KPNX broadcasts the team's preseason games on television (which, that year, included the Hall of Fame Game broadcast by NBC), called by Pasch and Wolfley, with station anchor Paul Gerke as sideline reporter. The broadcasts are syndicated regionally to KTTU and KMSB-TV in Tucson, and KVVU-TV in Las Vegas. ^ "Arizona Cardinals Team Capsule" (PDF). 2018 Official National Football League Record and Fact Book. NFL Enterprises, LLC. August 9, 2018. Retrieved August 16, 2018. ^ Urban, Darren (November 7, 2017). "Cardinals Ready For Color Rush". AZCardinals.com. NFL Enterprises, LLC. Archived from the original on November 8, 2017. Retrieved August 16, 2018. ^ a b "Arizona Cardinals Team Facts". Pro Football Hall of Fame. Retrieved October 2, 2017. ^ "Franchise History" (PDF). 2018 Arizona Cardinals Media Guide. NFL Enterprises, LLC. July 13, 2018. Retrieved December 31, 2018. ^ "All-Time Records of Current NFL Franchises" (PDF). Pro Football Hall of Fame. February 10, 2017. Retrieved May 15, 2018. ^ Griffith, R.D. (2012). To the NFL: You Sure Started Somethin': A Historical Guide of All 32 NFL Teams and the Cities They've Played In. Dorrance Publishing. p. 2. ISBN 978-1434916815. ^ Wyche, Steve (June 29, 2011). "Before coming to desert, Cards were substandard in St. Louis". SuperBowl.com. NFL Enterprises, LLC. Retrieved June 11, 2016. Having grown up in St. Louis, I was always resigned to the fact that the football Cardinals, regardless of where they were located, would never play in a Super Bowl. ^ Eskenazi, Gerald (March 16, 1988). "N.F.L. Approves Team Shift". The New York Times. Retrieved June 11, 2016. ^ "Arizona Cardinals Team History". Pro Football Hall of Fame. August 26, 2015. Retrieved August 26, 2015. ^ Wesseling, Chris (January 24, 2016). "Arizona Cardinals' biggest stars fall flat in Carolina". NFL.com. NFL Enterprises, LLC. Retrieved August 21, 2017. ^ "Cards Brush Up Bird". AZCardinals.com. NFL Enterprises, LLC. January 27, 2005. Archived from the original on November 22, 2005. Retrieved August 26, 2015. ^ "Cards Unveiled New Uniforms". AZCardinals.com. NFL Enterprises, LLC. April 21, 2005. Archived from the original on April 21, 2005. Retrieved June 9, 2016. ^ Somers, Kent (October 29, 2009). "Is white out for the Big Red?". The Arizona Republic. Retrieved June 11, 2016. ^ Urban, Darren (April 22, 2010). "Cards Unveil Third Jerseys". AZCardinals.com. NFL Enterprises, LLC. Retrieved July 7, 2015. ^ Lukas, Paul (February 22, 2010). "There's No Service Like Wire Service, Vol. 6". ESPN. Retrieved February 22, 2010. ^ a b c d e "Chicago/St. Louis/Arizona Cardinals Single-Season Passing Leaders". Pro-Football-Reference.com. Sports-Reference. Retrieved August 7, 2018. ^ a b c d e f "Chicago/St. Louis/Arizona Cardinals Single-Season Rushing Leaders". Pro-Football-Reference.com. Sports-Reference. Retrieved August 7, 2018. ^ a b c "Chicago/St. Louis/Arizona Cardinals Single-Season Receiving Leaders". Pro-Football-Reference.com. Sports-Reference. Retrieved August 7, 2018. ^ a b c "Chicago/St. Louis/Arizona Cardinals Single-Season Kick & Punt Returns Leaders". Pro-Football-Reference.com. Sports-Reference. Retrieved August 7, 2018. ^ a b c d "Chicago/St. Louis/Arizona Cardinals Single-Season Kicking & Punting Leaders". Pro-Football-Reference.com. Sports-Reference. Retrieved August 7, 2018. ^ "Hall of Famers by Franchise". Pro Football Hall of Fame. August 26, 2015. Retrieved August 26, 2015. ^ "Cardinals Preseason Games Will Air On NBC". AZCardinals.com. NFL Enterprises, LLC. July 19, 2017. Retrieved August 21, 2017. ^ Cox, Seth (July 19, 2017). "Arizona Cardinals preseason games to be available on NBC locally". Revenge of the Birds. Retrieved August 21, 2017.